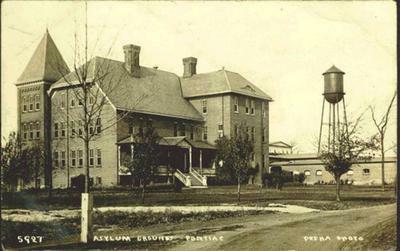 The old Clinton Valley State Mental Hospital in Pontiac, Mi.was known as a place of torment. As a child, a few of my friends and I decided to investigate one of the condemned buildings that were supposedly no longer in use. Upon entering the delapidated building through a lower level window, we were met with total darkness. Our only sense of guidance were the walls that we followed using our hands. We had no idea of what was in front of us (or behind us for that matter). After tripping over numerous obstacles and trying to convince ourselves to continue our journey, nothing could prepare us for the piercing screams that we heard in the near distance. This building was condemned ! Why is "someone" or "something" in here with us ? That was a question that we asked ourselves after we almost trampled each other in an attempt to escape whatever was in that building with us. The hospital was demolished nearly a decade and a half ago. A sub-division was built in its place. I personally know people that have lived there and they all have unexplained tales of what goes on in and around thier homes. As for me and my friends... We have no answers for what we encountered in that dark, terrifying place.